A mass of yellow cocoons attached to the end of a twig. Hi! It’s been a few weeks, hasn’t it? I have all these pictures and draft posts but no time to finish any of them because I am trying to get my analyses done for the ecology conference this August. I am tragically productive. 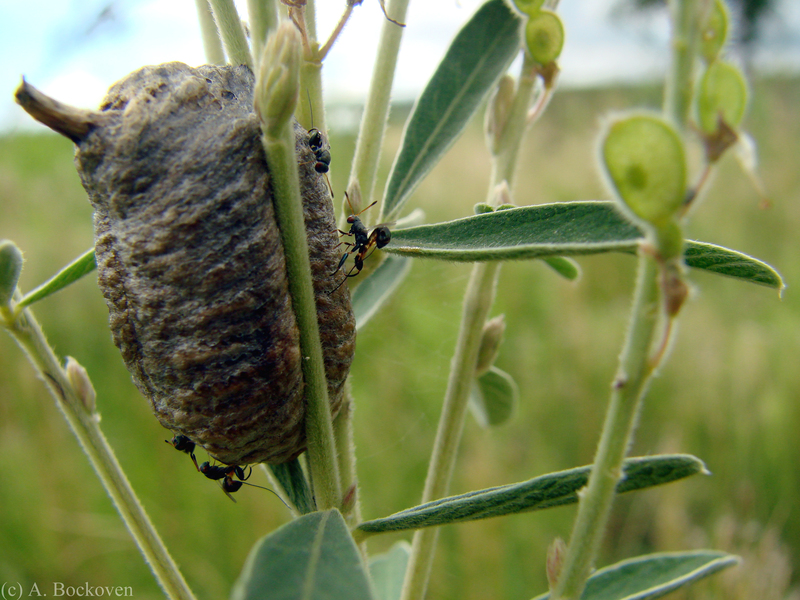 Here are some cocoons I found up at the Oklahoma biostation back in spring. Cocoons are awesome because they are basically insects you can rear without actually doing any work. I stuck these guys in a jar for a week or two to see what would emerge. What I got was tons of tiny black and brown wasps. I took some pictures under a scope and threw them up on BugGuide where I they were quickly ID’ed by the excellent Bob Carlson. BugGuide is awesome, because it is basically network of experts you can access without actually doing any work. A female braconid wasp (Cotesia), emerged from the cocoons. 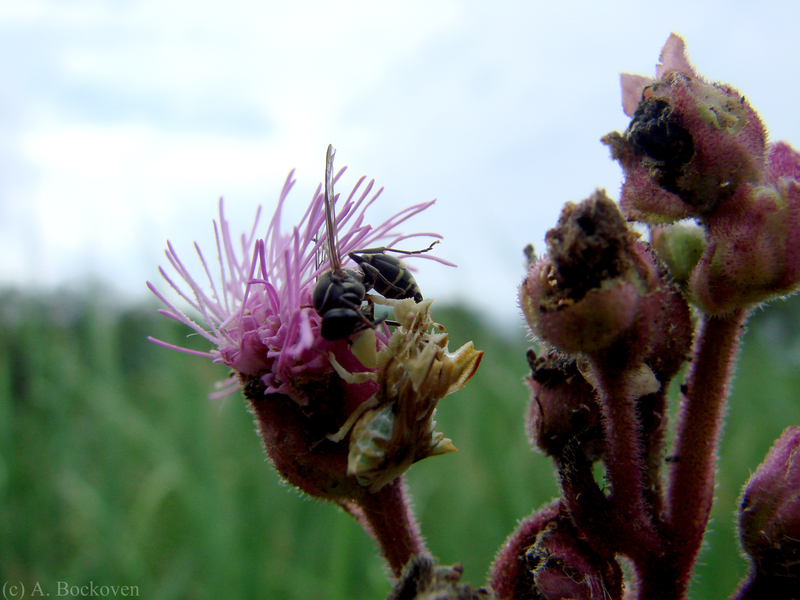 The black wasps turned out to be members of the genus Cotesia, in the family Braconidae. 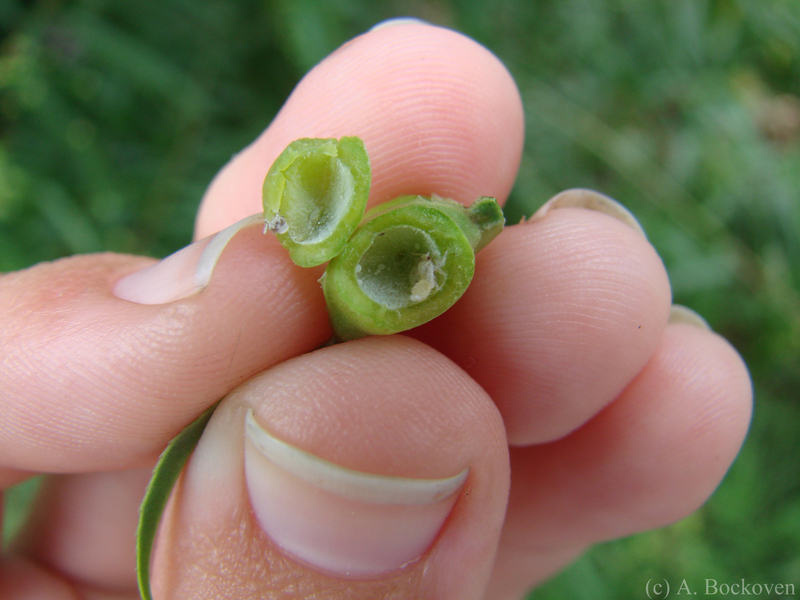 These are parasitoid wasps which lay their eggs on (or in) caterpillar hosts. The larvae develop inside the caterpillars Alien-style, slowly eating them alive, before eventually emerging to pupate and seek out new hosts. 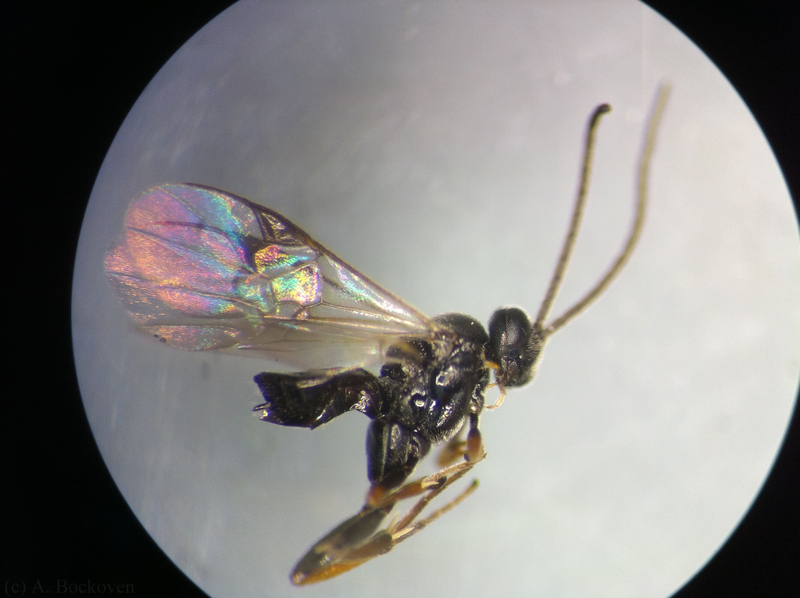 A female ichneumonid wasp (Mesochorus) emerged from the cocoons. An ensign wasp (Evaniidae) perched on a wall. 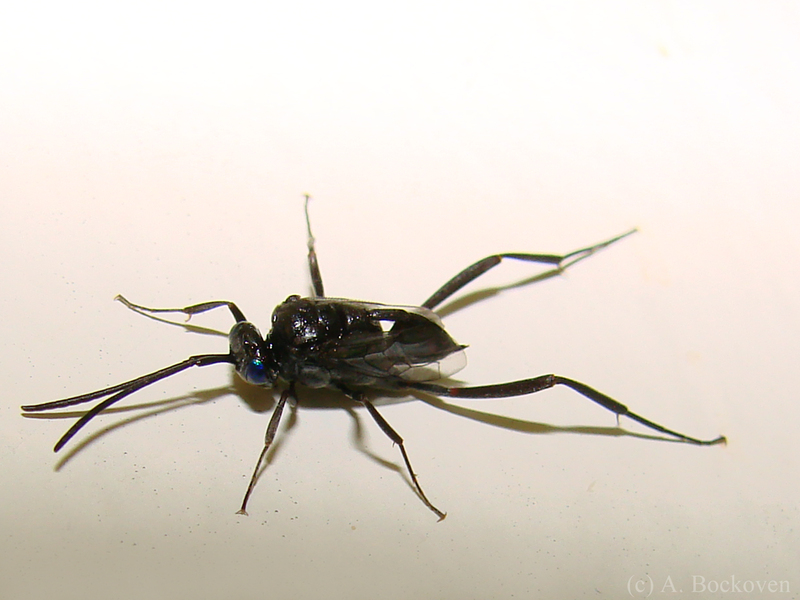 Due to their long legs and antennae, an ensign wasp on a wall may resemble a spider from a distance, and like spiders, they ought to be welcome guests in a home. These little wasps are unable to sting and harmless to humans, but they are deadly to roaches. 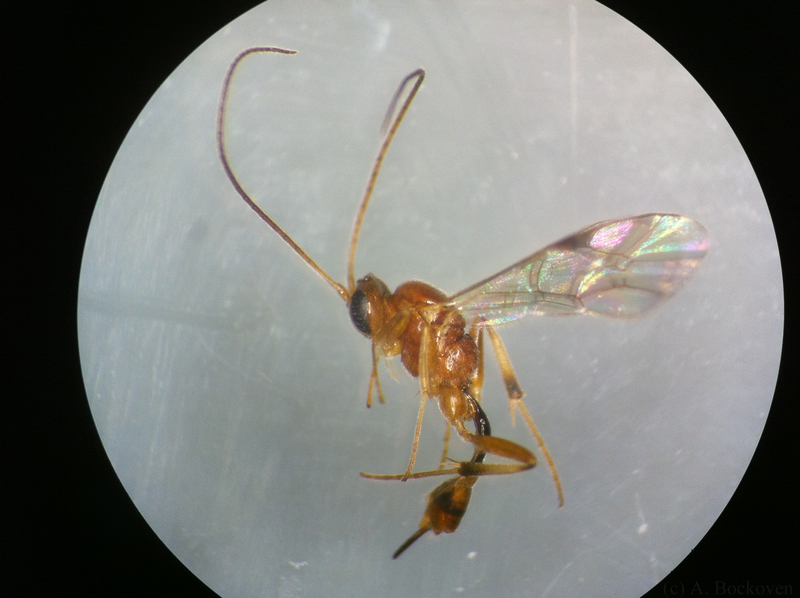 Like many other small wasps, ensign wasps are parasitoids: the female ensign wasp lays her eggs only in the egg cases of cockroaches, where the larvae hatch and quickly devour the cockroach eggs. Ensign wasps (also called hatchet wasps) are members of the family Evaniidae, and take their common name from the distinctive shape of their gaster (rear end). It is flattened laterally, and attached high like a flag. Much like a banner waver, they will twitch their gaster rapidly up and down when disturbed. The species I find around here is also notable for the attractive blue eyes that can be seen under a hand lens. They main body is perhaps 1cm long, with the legs and antennae nearly doubling the size. I found the wasp pictured above hanging around in the hallways of our building on campus, defending us from roaches. 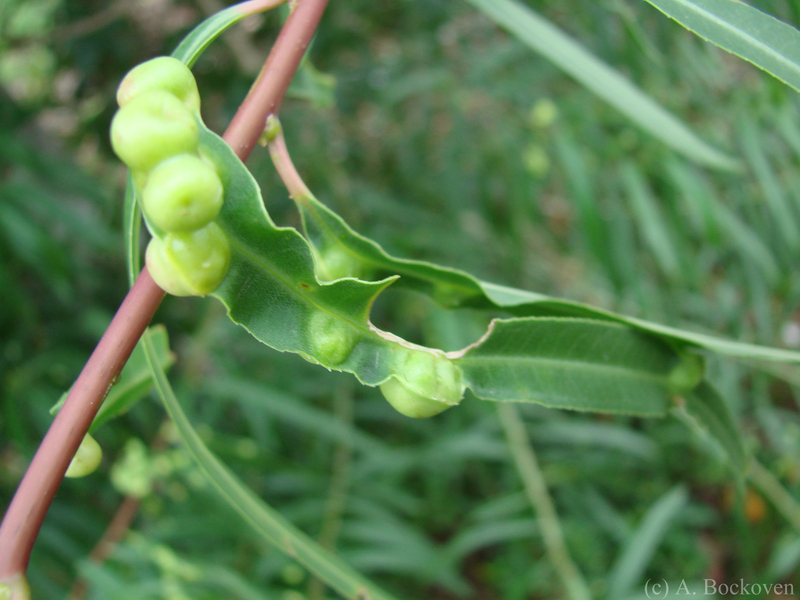 Parasitoid wasps parasitize an insect egg case. ‘Parasitoids’ are distinguished from ‘parasites’ in several ways. A parasitoid insect lays one or multiple young on or into a single host organism–often a juvenile or egg. The young develop inside the host, which may live on for some time, but almost always ultimately succumbs to the creature devouring it from the inside out. Anyone who has watched the movie Aliens may find this sequence of events familiar. 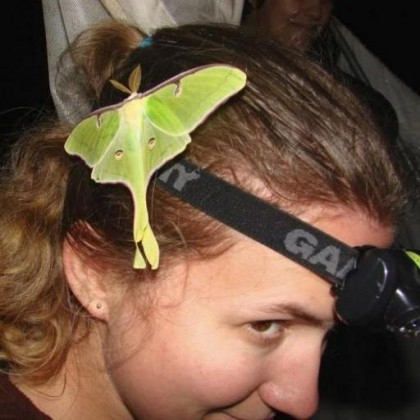 Parasitoids thus are not true parasites as they kill their host, but not quite predators, in that they consume only one prey item during the course of their lifespan.